Click on Arrow at bottom of screen to begin video. Fort Myers, FL (October 14, 2013) – Gun Owners of America and the Florida Citizens Alliance announce their endorsement of the Florida Second Amendment Preservation Act. This act would protect individual rights guaranteed by the Second Amendment by declaring any federal acts, laws, orders, rules, and regulations in violation of this amendment invalid in the state of Florida. These organizations look forward to seeing this bill enacted into law in the Florida 2014 legislative cycle. 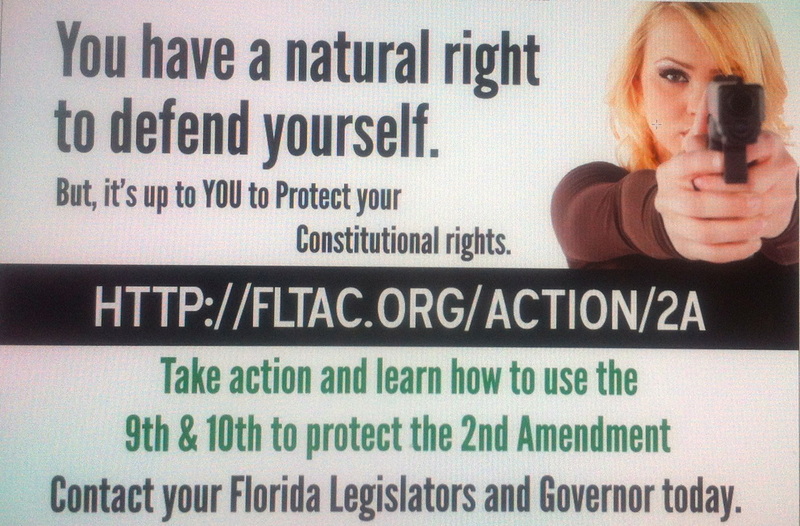 For more information on the Florida Second Amendment Preservation Act, visit www.fltac.org/2A. To learn more about Gun Owners of America and their support of this bill, visit www.gunowners.org. Attendees at the Florida Gun Show event held this weekend in Orlando showed their overwhelming support for preserving their Second Amendment right in Florida by signing a citizen petition for the Florida Second Amendment Preservation Act. FL2APA representatives from Orange County and Osceola County joined forces and secured 460 citizen signatures and countless promises to visit the Florida Tenth Amendment Center’s TACtion website. The success of the petition drive is greatly attributed to the generosity of the Florida Gun Show promoters who graciously provided FL2APA a table inside the show at no charge. In addition to the citizen petitions, several businesses within the show offered to sponsor links on their websites to help promote the cause.